Wrapping up our series ‘How To Pray’, today’s image sums up all we’ve learned in the last two weeks. The image for the day will speak to each viewer where they are at, so I will limit my interference by keeping this post short. The yellow on the left is life and all the dirt that comes with it. The words circumstance, worry, and fear are all buried inside this color. ‘Fear’ is positioned so that the ‘r’ hooks the back of the blue figure’s head, attempting to pull it down. You are the dark blue figure. You and everything else that comes with you. 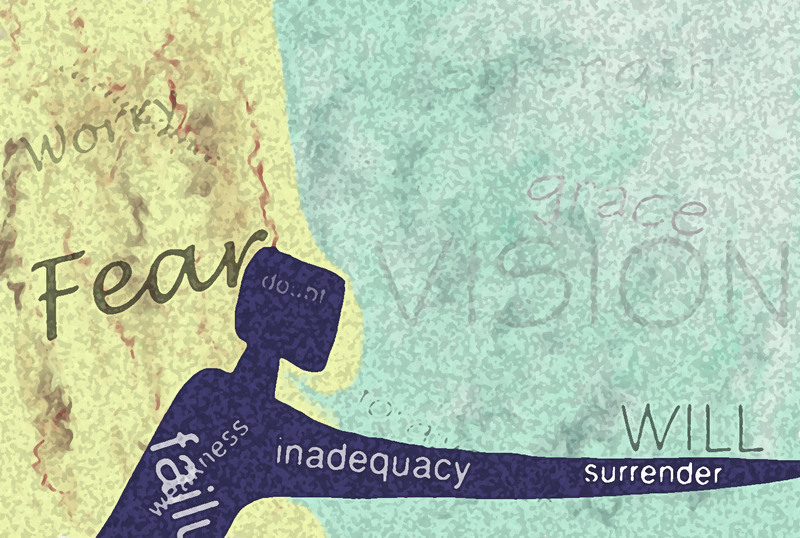 Flowing inside the body are the words doubt (strategically placed), weakness, failure, inadequacy, and surrender. The light blue on the right represents the Holy Spirit, the one who intercedes for us and communicates through our prayers. When we pray, God offers us grace, forgiveness, strength, vision, and His will. The key to powerful prayer is total surrender. By surrendering our will, we are free to follow His. The last thing I want you to notice is the movement in the image. As ‘fear’ pulls the figures head down, the Holy Spirit reaches under its chin, lifting the head back up.